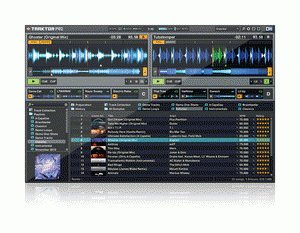 Native Instruments today announced the new TRAKTOR generation, which establishes the next level of power and ease-of-use with its TRAKTOR PRO 2 software and TRAKTOR SCRATCH PRO 2 digital vinyl system. Based on versatile new software features and a revised audio interface line, the new product generation expands the lead of Native Instruments' TRAKTOR range and gives DJs even more creative possibilities. By keeping the tempo of multiple tracks in sync without manipulating the phase, SoftSync accommodates the widest possible range of mixing techniques both in TRAKTOR PRO 2 and in TRAKTOR SCRATCH PRO 2. The effect selection of TRAKTOR has also been expanded with four additional types that offer unique ways to create dramatic breakdowns and other typical performance effects, including a tape delay emulation and the new "Bouncer", increasing the arsenal to an unparalleled assortment of over 30 algorithms.